The St. Louis Cardinals bullpen gave up three runs in the eighth — accompanied by a David Freese error — in yesterday's 5-3 loss to Cincinnati. Whatever. 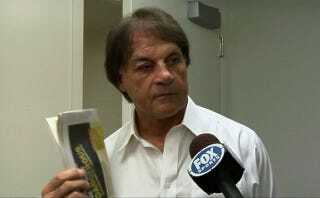 Let's see what LaRussa's eye looked like. As always, if you have a screen grab from tonight's Cardinals game highlighting LaRussa's putrid-chic style, send it along. 8 p.m., ESPN, LeCure vs. Westbrook.